I write this after another wonderful date night with PB. I’m going to Sydney tonight and we really enjoyed the time to re-group and enjoy each others company before I head off for 5 days. So, I may approach the review of this restaurant in a slightly biased fashion, because above all, the company is what makes the experience truly enjoyable. We really did enjoy our meal at Edo & Bibo, if you’re on a date then the counter seats are perfect for a tête-à-tête, and larger groups are also very easily accommodated. It was certainly a good sign that on a Thursday night, there was not an empty table in sight. We were the only ones on the counter, which was set up for groups of two. 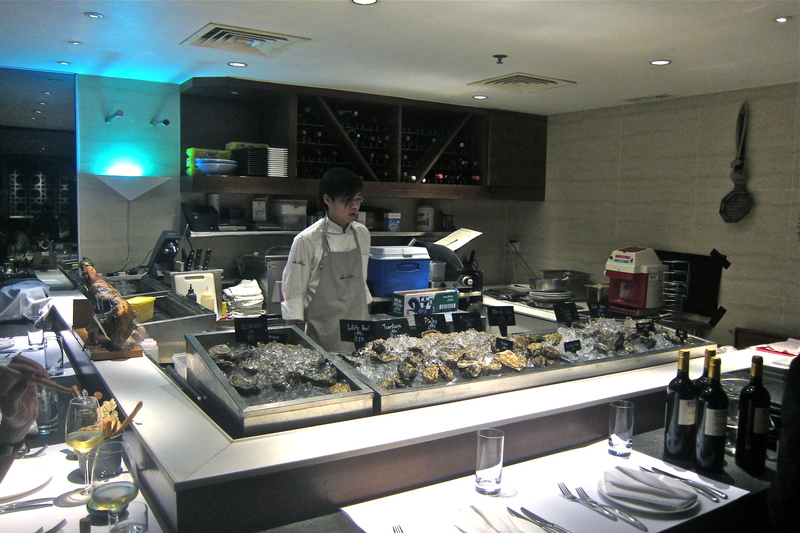 From here, you can see all the action, from the oyster shucking to the salad mixing and even the tartare making. PB had already ordered the wine by the time I’d arrived, and when I asked him what he thought of the selection, I got a shoulder shrug in response – he was not very inspired it seems. He did pick a nice Chablis however, which went well with the oysters. If you’d like to BYO, corkage is HK$150 a bottle. 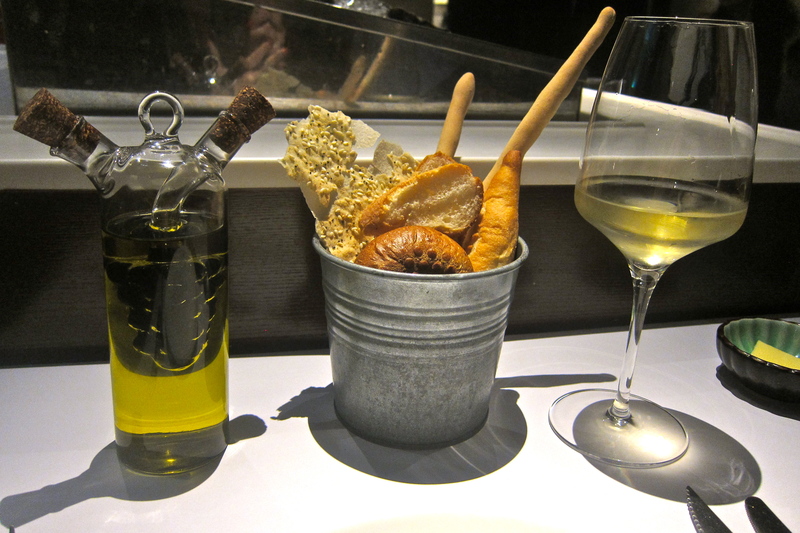 The bread selection was nicely presented, but not very good quality at all – the baguette was toughly chewy (now that’s an oxymoron!). Oh well, we’re not there for the bread. We were there, however, for the OYSTERS! If you are an oyster lover too, make sure you get to the restaurant before 9pm, or you might find the selection severely diminished. The oysters are delivered fresh daily, and E&B is one of four establishments in the same building (all opened by ET Troop) that serves these oysters. Certainly by the end of our meal, there was scant choice left on the ice. 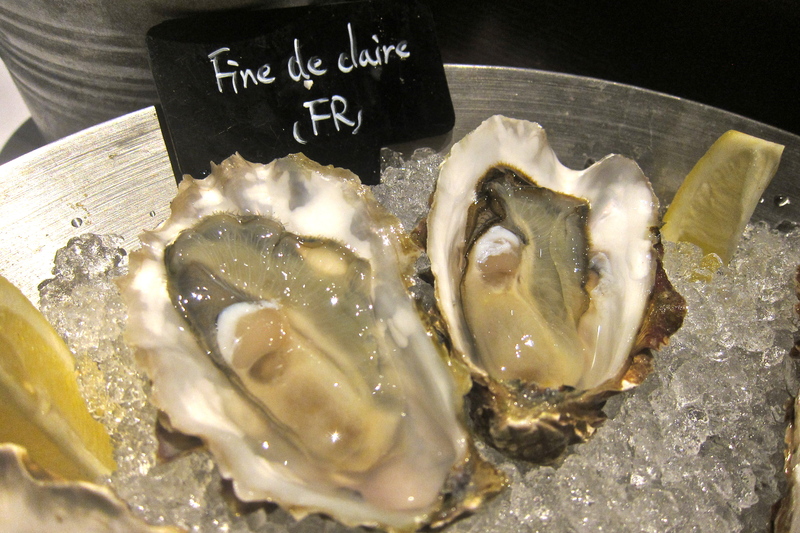 A wide choice of French oyster selections, not just your usual fine de claire. 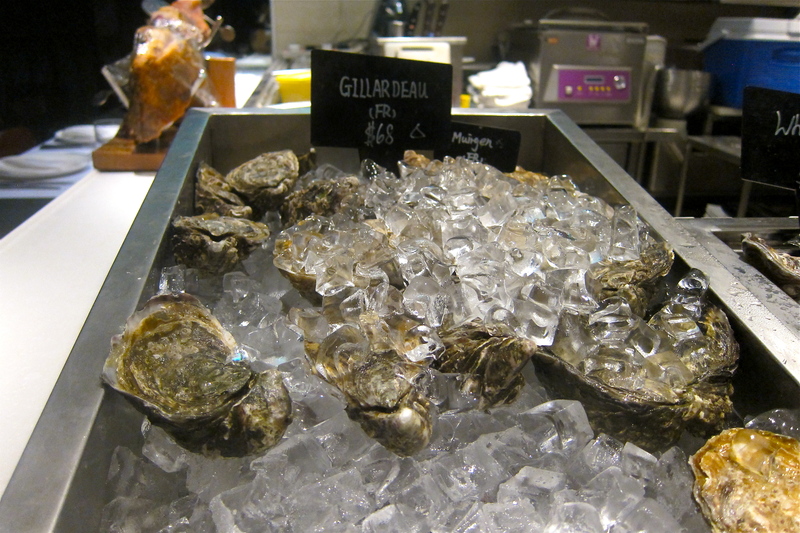 The Gillardeau oysters are produced by a small farm owned by the Gillardeau family, which produces only spéciales – a fleshier and thus more expensive oyster. Theirs is a very interesting story, which you might like to read about in this New York Times article. 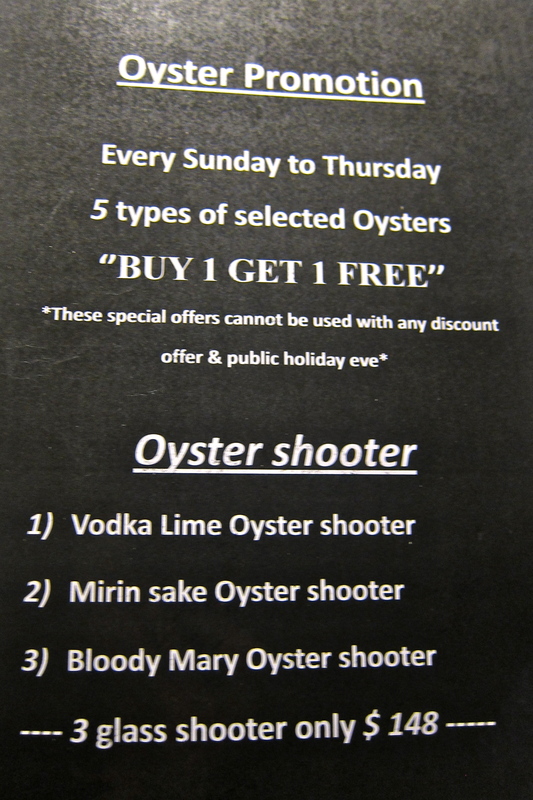 And a selection of international oysters..
That day, the oysters included in the buy one get one free oyster promotion were Pacific Rock, Irish Gigas, Fine de Claire, Osole, and Tsarskaya. 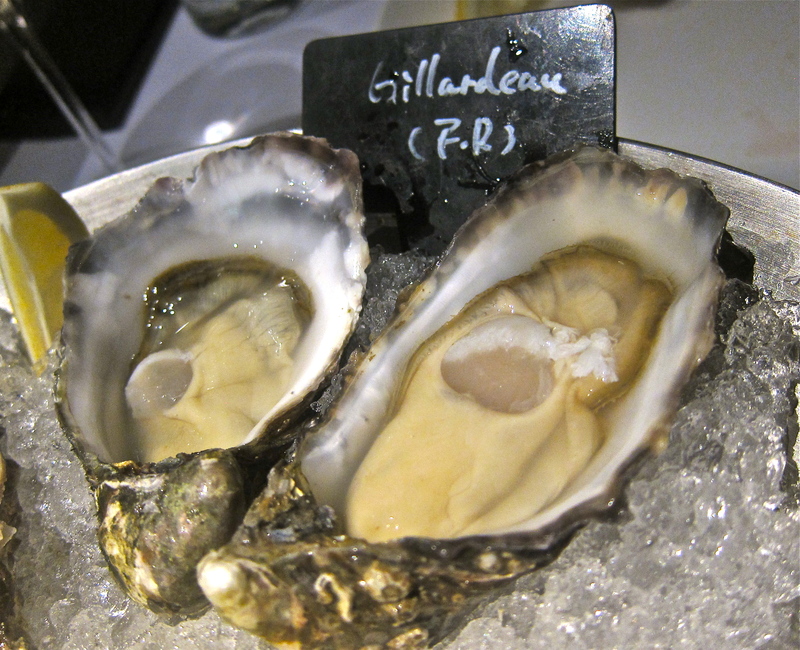 Not being a huge fan of Pacific Rock oysters (those things are massive – I always feel like gagging when I eat them), we chose the other four plus two of the Gillardeau spéciales. 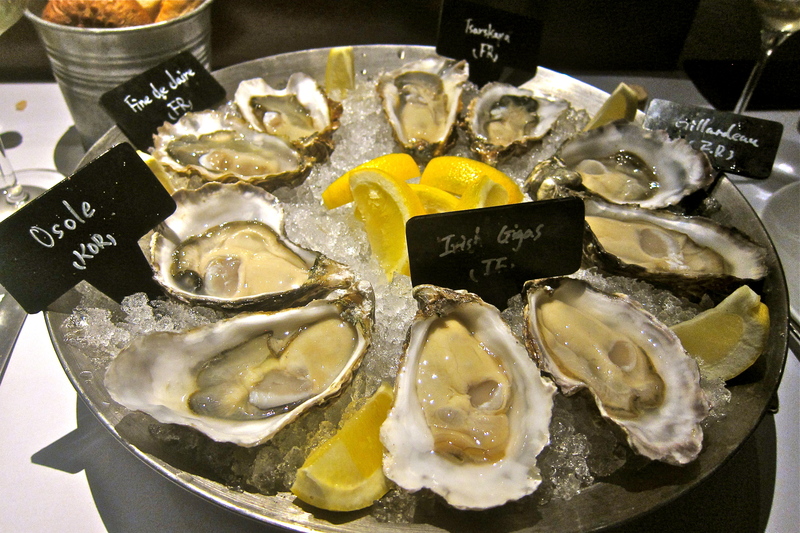 The oysters on display in all their glory! We were in for a treat! I have read some mixed reviews of Edo & Bibo (Janice @ E*ting the World was certainly not impressed), but I for one was very pleasantly surprised by the variety, freshness and taste on offer here. The oysters were expertly shucked, and each one seemed to retain the flavour of the water from whence they came. I am a regular customer at Oyster Station in SoHo, and I must say that the oysters at E&B certainly are served with more care. 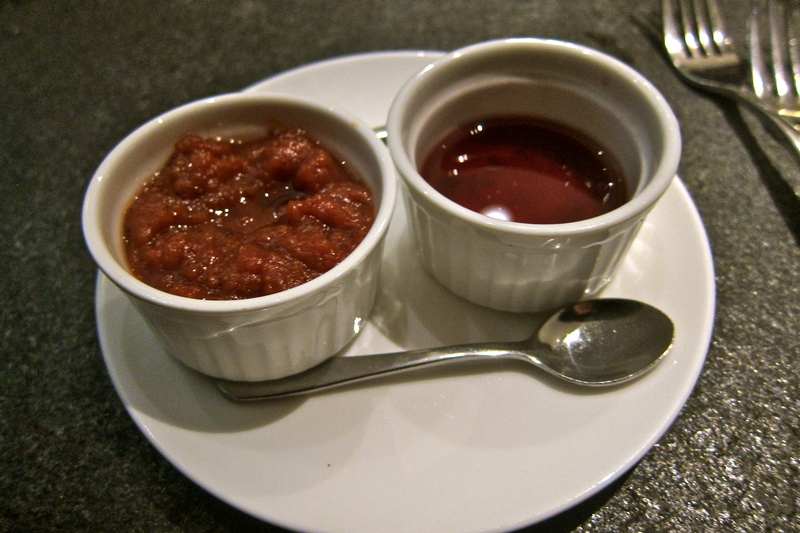 A scrumptious cocktail sauce is served, chunkier than most and although it is most likely made with canned tomatoes, it tastes fresh. The red wine vinegar is is dark and seems almost to have a condensed vinegary-ness – a little goes a long way. 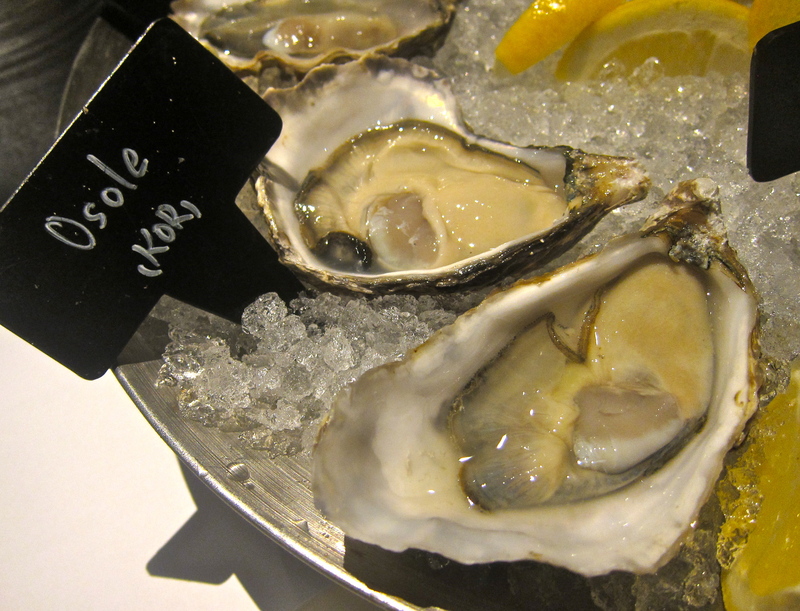 We started with the Irish Gigas (HK$58 for two), which were less creamy than I remember them being, in a good way. Perhaps it was due to the fact that they were served quite cold so it made the creaminess more bearable. 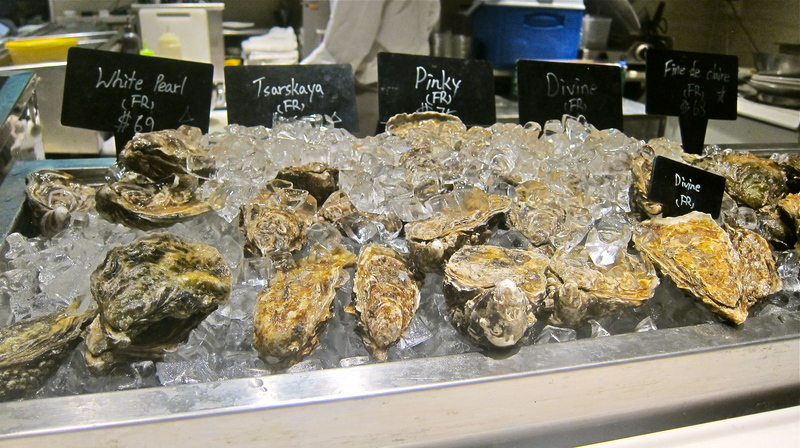 This is the first time I’ve heard about Korean oysters, let alone eaten one. The Osole were meatier, the water saltier, but for some reason, not our cup of tea at all. I can’t put my finger exactly on it, but the Osole somehow lacked the refined taste of the other oysters. Fine de Claires are always smaller, more crisp, and somehow more savory, and always yummy. They are fine in every definition of the word. 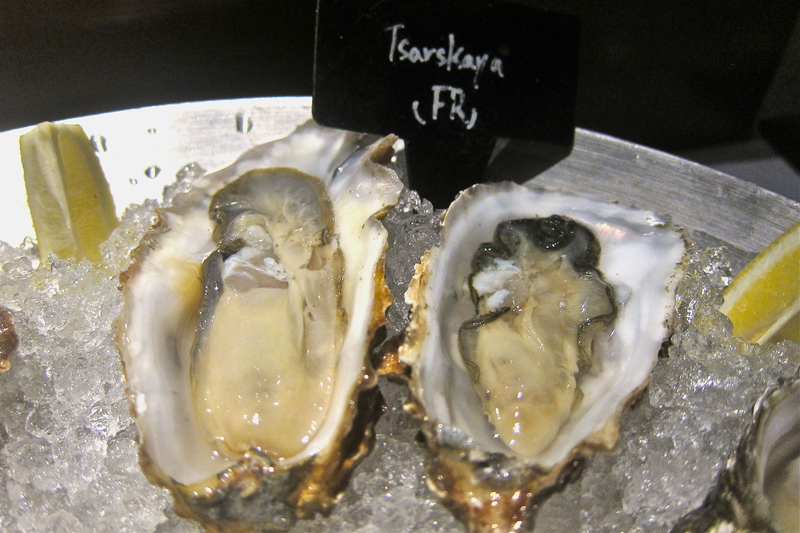 From Brittany, the Tsarskaya oyster is meant to be more creamy with woody accents, apparently. I say that because it’s the first time I’ve tried them. They are longer in shape, and these ones had a bit too much membrane for me. 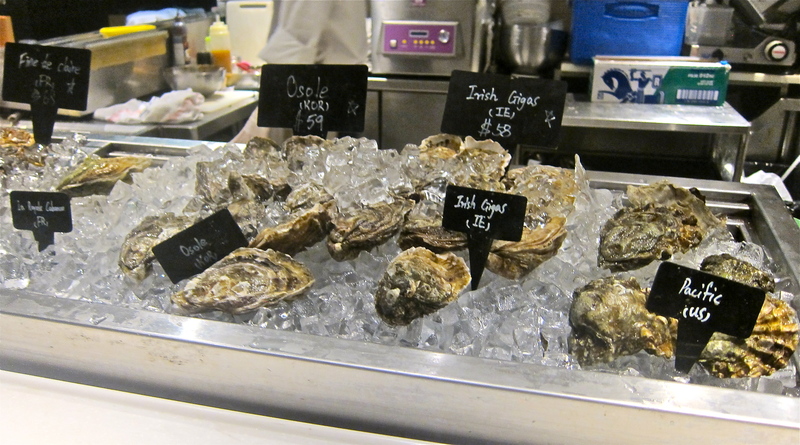 They were a bit on the skinny side too – the Kate Moss of our oyster selection. These babies were beautiful, and the all-around favourite. Big, but not to meaty and not too creamy, delicately flavoured with a beautiful briny taste – just perfect really. Too bad they weren’t part of the two for one offer because I could have had a whole plate of them. Just as quickly as it had started, our oyster round was over (boo). We moved on to our second round of starters, the first we chose from their “Chef Specials”: Edo & Bibo Signature Caesar Salad with Apple Wood Smoked Bacon and Fresh Graded Parmeson (sic)”. 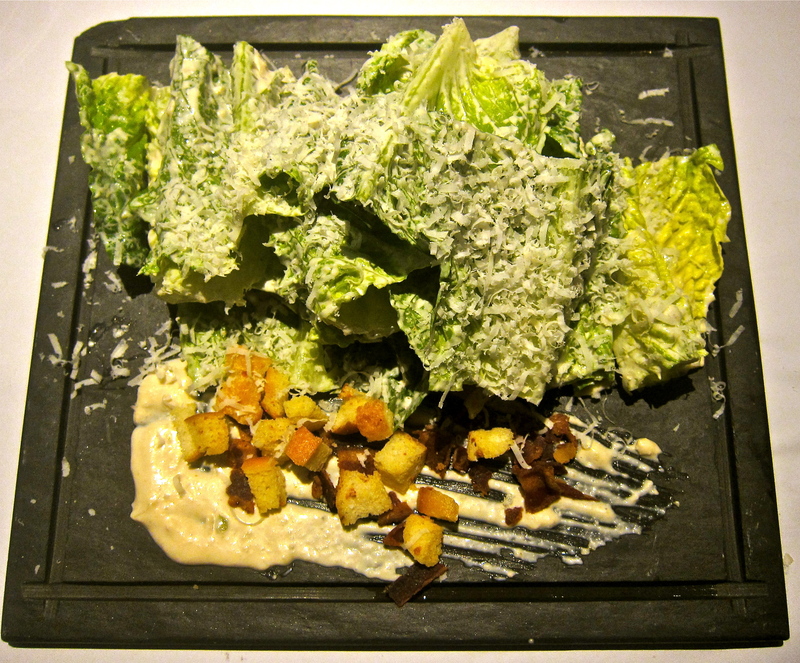 As far as Caesar Salads go, it was definitely one of the better ones – crisp Romaine lettuce, a nice tangy creamy dressing. Using the dressing as a plate garnish was somehow lost on us, and there was not enough of that (very nice) bacon. It also rained Parmesan onto our plates when we picked up each leaf – but I love that stuff.